This week's Reader includes our annual Fall Arts guide, and for me it's always hard to choose what to cover in its music section—there's so much that's worthy. Both International Contemporary Ensemble (which started out in Chicago before relocating to New York) and Ensemble Dal Niente recently released details about their fantastic Chicago programs for the season, and I think they're just as worthwhile as the events I picked for Fall Arts. On Friday ICE begins its fall season in town with a free concert at Corbett vs. Dempsey: a harp recital by North Shore native Nuiko Wadden, performing Ernst Krenek's Sonata for solo harp (1955) and new works for the instrument by Angélica Negron and Suzanne Farrin. 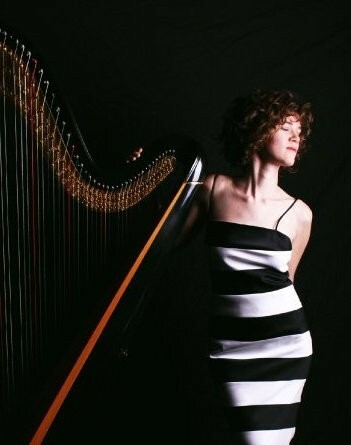 In addition to being part of ICE, Wadden is principal harpist in the Pittsburgh opera and ballet orchestras and the Des Moines Metro Opera, but her involvement in the excellent trio Janus is most pertinent to new-music enthusiasts (Janus will perform in Chicago on February 9 at Lyon & Healy). Friday's performance is free, but space is limited—reserve a spot by e-mailing rose@iceorg.org. In the video toward the bottom of the page you can check out Wadden performing the sixth movement of Kaija Saariaho's ballet Maa, from a 2010 ICE performance at Mount Holyoke College in Massachusetts. ICE will also continue its invaluable residency at the Museum of Contemporary Art with three great-looking concerts this season, including one dedicated to the music of John Cage and Pierre Boulez on October 6. The other performances will focus on new compositions by Carla Kihlstedt and Phyllis Chen (on February 16) and the world premiere of The Whisper Opera by David Lang (on May 31). There's also a concert of new work by Latin American composers, including Chicago's Marcos Balter, at the Museum of Contemporary Photography on December 8. Unfortunately, these are the only ICE events announced at this point—the group seems to be concentrating on expanding to other cities rather than remaining a strong presence in Chicago. Chicago's own Ensemble Dal Niente performed at the prestigious Darmstadt Music Festival in Germany this past summer and took home the Kranichstein Music Prize, and it seems that the group will be hitting the road more as well. In fact this season they're booked in Chihuahua, Mexico, and Victoria, B.C., Canada. But most of their concerts are in town, and the programs have never been more exciting and ambitious. On November 16 the group will be joined by superb Israeli composer Chaya Czernowin for a concert of her music at Northwestern, and a February 28 concert at the Ruth Page Center for the Arts will feature the local premiere of In Vain by Austrian composer Georg Friedrich Haas. But the Dal Niente is also presenting cutting-edge music in less tony surroundings, including a challenging program called Hard Music Hard Liquor at Mayne Stage on December 14, which includes pieces by Bryan Ferneyhough, Stefan Prins, Lee Hyla, György Kurtág, and Frank Zappa, and an Empty Bottle show in May that's part of the club's first new-music series. Dal Niente also hosts a benefit concert on Sun 9/16 at High Concept Laboratories featuring music by Cambodian-American composer Chinary Ung.